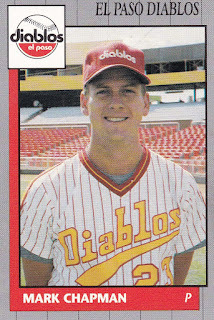 The El Paso Diablos only needed starter Mark Ambrose and reliever Mark Chapman to pitch the Diablos to a victory this night in June 1991, according to The El Paso Times. The outings, including Chapman's two inning of work, gave the Diablos bullpen much-needed rest, The Times wrote. "Ambrose and Chapman had outstanding games," Diablos manager Dave Huppert told The Times afterward. "We needed this in a big way." Chapman finished up that game in the midst of his fifth season as a pro. He only saw one more. He never made AAA. Chapman's career began in 1987, taken by the Brewers in the 18th round of the draft out of Auburn University. At Auburn, Chapman struck out 15 in a March 1986 game. He also threw six complete games each in 1986 and 1987. He won 26 and struck out 245 over his career there. His sixth complete game of 1987 gave Auburn a regional win. It also gave him the school record for innings pitched. He ended with 343.1 innings pitched, more recently sixth all-time. Chapman started with the Brewers at rookie Helena. He went 3-1 there, with a 1.31 ERA over 27 relief outings. He also saved 13. He moved to single-A Beloit for 1988. He saved 26 there over 55 outings. He ended with a 1.81 ERA. Chapman arrived at AA El Paso for 1989 and stayed there for three seasons. His best ERA came in 1991, 3.72. He saved a total of 10 games over his time there. He played 1992 with the Expos at AA Hagerstown. He went 4-2 there, with a 2.91 ERA to end his career.